Put the tamarind for the marinade in a bowl and add 3 tablespoons hot water. Squeeze the tamarind until the flesh dissolves. Strain the liquid, then mix 2 tablespoons of it with the other marinade ingredients. Toss in the chicken and leave for 1 hour. Meanwhile, place the cashews in a blender, and blitz for a few seconds, then add the cream and blitz until you have a rough paste. 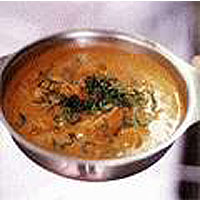 Put the cashew paste in a pan with the other sauce ingredients, except the cream, coriander and butter. Simmer for 25 minutes, adding a little water if needed. Stir often, to prevent the sauce sticking. Thread the chicken on to long skewers and suspend them over a roasting tin. Put in the oven and roast for 15 minutes until golden. Add the chicken to the sauce on the hob and stir in the butter, cream and chopped coriander. Taste and season with salt or extra chilli if desired. Serve garnished with more fresh coriander.